Crossing the tundra was painful. The constant pounding of hard snow on steel was sending sharp pains up and down my spine, making it miserable. It was cold too, 40 below zero, and the snow was practically gone. The wind had done its job. In the back of my mind I could hear my father, 6,000 miles to the south, talking to me. “Watch what you’re doing,” he would say. And as clear as day, I could also see my son’s face – home, warm, happy and waiting for me. Will I ever get back? Deep down I was scared in this place. THERE HAVE BEEN MANY of these experiences during my time in the Arctic – dangerous situations that should have been avoided but weren’t. Let’s go anyway, I would say. I was younger then and had a lot to learn. Luckily, I have since then, but only after several close calls. Maybe that is what experience hunting in the high Arctic does for you. It gives you experiences that most can’t fathom or even want to. A few of these experiences stand out, most happening in the deepest depths of winter, when conditions are the most dangerous, especially when it comes to predicting the weather and what it will do. Yes, you can try, but once you leave the security of home and venture “out here” things can and are usually quite different. The windswept tundra and the cold, hard river can play hell on your decisions like no other, but you go anyway. The best and worst experiences have come during February and March. All have had to do with muskox or subsistence hunts, and later, grizzly. Occurrences evolved into situations, but only until later or after the fact. Some of those dangerous instances rode on decisions that would decide whether you lived or died. If it sounds serious, it’s because it was serious. Probably the biggest near-tragedy I’ve ever been involved with was the time Lew Pagel and I decided to chase muskox on the Alaska Peninsula. Being outside wasn’t ideal, but it was the last day of the season and we had to get it done. Muskox tags are hard to come by and it was Lew’s first one. We had to try. As usual it was cold, but it was clear and calm when we left home. Seventy-five miles south it wasn’t. The wind-scarred tundra combined with dropping temperatures made it quite miserable, but we were lucky and did find a herd of muskox. Lew took his bull late in the day, and even though we were happy we knew it was going to be a cold, dangerous ride home in the dark, especially having to cross the ice. Snowmachines work great in most weather, but not so much when it’s approaching 50 below. A busted gas can didn’t help and the constant fogging of goggles made things worse. Open leads in the ice while driving in the dark scared the crap out of me, but there was no other choice. We had 25 miles to go to the nearest shelter cabin, placed along the trail for weary travelers to use during the winter, and if we could get there we would be fine. As we inched along I could feel the burning sensation of frostbite inside my nose and the cold numbness seeping through my snow gear. It was getting serious. Luckily for us it worked out; when the headlights shined on the green paint of the cabin, I knew we were saved. Broken, but saved. There have been other instances of close shaves, like the time I was hunting grizzly in March. I was young then and had newly arrived in the Arctic, so to say I was a novice is an understatement. As a native Oklahoman, I had never even seen a snowmachine before – let alone ridden one – and the experience I did have only included riding in front of town to go ice fishing. My first snowmachine, which was an old Polaris I had picked up used, did OK, but this was my first long excursion into the unknown, which created a mixture of excitement and nervous anxiety. The 100-mile journey went well at first. We saw sheep, caribou and moose, plus the side-hilling and deep snow wasn’t too tough to get through. I only got stuck a few times, and with the help of others I was out in no time, even though they were starting to get frustrated with me. However, it was a different story once we got into the trees, where the snow turns to sugar. I buried that machine so many times and it took what seemed like hours to get it out. I was soaked in sweat from digging, only to get stuck again and again. It wasn’t fun; it was miserable. Finally, we found some harder stuff to make the ride through the trees more manageable. As we cruised along at a comfortable speed, I was keeping one eye on the guys ahead of me and the other on my surroundings when I noticed my comrades had disappeared and the tree line ended just ahead. A bad feeling swept over me just as I came to a cliff overlooking a drop onto the river. My team had made it down and across and were coaxing me onward. I didn’t want to go off the edge, but I didn’t have a choice. I hit the throttle and eased down the bank. I didn’t know it at the time and couldn’t even see it, but the river was soft and covered in overflow and seeping water. I made it down only to bog down in the middle. I was sinking and sinking fast, scaring me beyond belief. I had heard of overflow (water on top of ice, sometimes called aufeis) but didn’t have any experience with it. (It still scares me to this day.) Luckily, there was an ice layer underneath that stopped me, leaving the front of my machine sticking up through the frozen slush. I climbed up onto the cowling and wanted to cry. But my buddies were experienced and in no time inched out using a wooden sled and rescued me. We then tied a strap onto the front of my sno-go and winched it out. Since I was wet and shaking uncontrollably, they built a fire and warmed me up, which also allowed time for the machine to dry out a bit. When I felt better we tried the starter; to our surprise the machine fired up and we were on our way. I never did get a bear, but that was OK; I was just glad to get home! Having the right person or persons with you makes all the difference. If you’ve read my stuff before, you may have remembered the piece I wrote on hunting partners. Be picky and choose wisely, because you never know what circumstance will require help and teamwork to get you out of a situation. One of the scariest situations occurred several years ago, on a trip up north to look for sheep on a subsistence hunt. Because it’s a long way to those mountains, getting there is way more than half the battle. I’ve done it many times before, each trip with the right person, and with each occasion ending up as a successful hunt. I was surrounded by burnt tussocks, charred to shades of black and charcoal after a lightning storm-ignited fire. The landscape looked more like an eerie picture from a distant planet rather than the flats up to where the sheep were. With little to no snow my machine bucked and bounced me through them, and then it happened. The bright silver snowmachine ski that I had been staring at for hours suddenly caught on one of the tussocks and brought me to a dead stop. Like a horse throwing its rider, the machine was on top of me. It pinned me to the ground like a wrestler. I was stuck. With winter twilight fading in the western sky, I peered up at the moon through my plastic windshield. My mind kept telling me to panic, but I resisted. The machine was heavy, but I had a massive dose of adrenaline and in one desperate shove the machine was off of me and I was free. Covered in sweat, legs hurting and back aching, I got up to inspect the damage. Everything was in place so I instinctively reached for the starter, a tiny knob just above the seat and turned the key. Silence; I wasn’t going anywhere. My only salvation lay in my sled, a long blue flat piece of plastic that has followed me around for years and over many miles. I looked at it like a life preserver and begin untying the orange rope that held the tarp surrounding what would save my life. Frantically, I found the grey tote that held the one thing I knew that could save me and my hunting partner’s life. My tent. It was getting dark and we were 80 miles from anything that resembled civilization. I didn’t want to do it, plus a storm was blowing in. The tent would be our safest bet, but I couldn’t convince him. We were going, or I should say, he was going and I could come along. I’ve never felt dread but did at that moment. I had no choice; I had to go. Leaving my machine, sled and gear behind bothered me a great deal. Would I ever see it again? Would I ever be able to get back up here and retrieve it? And with little to zero snow, would it even be possible until next year? I was sick to my stomach. Darkness and wind were setting in and my hesitation was wasting time, which we didn’t have much of. I grabbed what gear I could and built a bed in the back of his wooden sled, but what would I take? I couldn’t take it all. I felt ill again. I grabbed my rifle, the one possession I would not leave without, and my tent. It took me years to acquire both, using savings and skimping to buy them. I left the rest – old friends left behind in the dark. It would be a rough ride but I thought I could handle it; I was mistaken. My partner’s urgency to get out of there, combined with panic, had set us both on edge. He wanted to leave – and I mean leave now – and I tried telling him to calm down. Hindsight is a funny thing, but we should’ve stopped and thought things out. Even though there was zero wood to build a fire, we had good sleeping bags and would have been fine staying in the tent, but we didn’t. The snow was cold but dry as it hit me in the face. I pulled down my facemask and beaver hat – thank God for their fur! The next 80 miles would be no problem, I said; I can handle it. I was wrong. Within the first mile I was in pain from the pulling and jarring of the sled. My back and kidneys felt like I was going 10 rounds with a prizefighter. But I had no choice. The storm increased in intensity and the trail back was almost unrecognizable, making travel a guessing game. I did have the one thing that I do not leave home without, my satellite phone. If nothing else, we could call and let somebody know where we were and what our situation was. Luckily, I had a worthy partner back home who knew how to read coordinates, and my GPS worked too. So every 5 miles or so we dared to stop and call. My buddy back home received and sent back info to guide us to safety. It was miserable, and the cold wind and snow were excruciating, but we made to a shelter cabin 60 miles from where my mishap occurred. I was bruised and battered but so happy to be alive and in one piece. We made it the rest of the way home the next day. I did eventually get back up there to retrieve my machine and gear, but it was a month later – and with the help of good friends who know how to take care of business. It was just as we left it. Even though I figured the bears and wolves would have destroyed it and ravaged the food we left behind, they didn’t. Editor’s note: Paul Atkins is an outdoor writer and author from Kotzebue, Alaska. He has written hundreds of articles on hunting big game and fishing throughout not only Alaska, but all of North America and Africa as well. 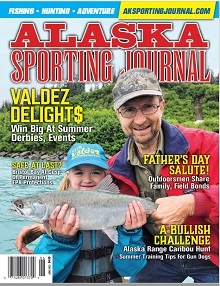 He is a regular contributor to the Alaska Sporting Journal.